All of us have at some point lusted for long, straight silky hair! Especially if you have curly or wavy hair, the grass always seems greener on the other side. Though poker straight hair might not entice everyone, silky smooth hair is ALWAYS something that is attractive. If you’re one of those straight hair loving people, this post is just for you. Here’s absolutely *EVERYTHING* you need to know about hair straightening. What Is Hair Straightening? Is It Permanent? Permanent hair straightening transforms your rough, curly hair using a chemical procedure. The results often last from a few months to about a year. There is a couple of different hair straightening processes. The results and the time your hair remains straightened depends on the type of procedure. 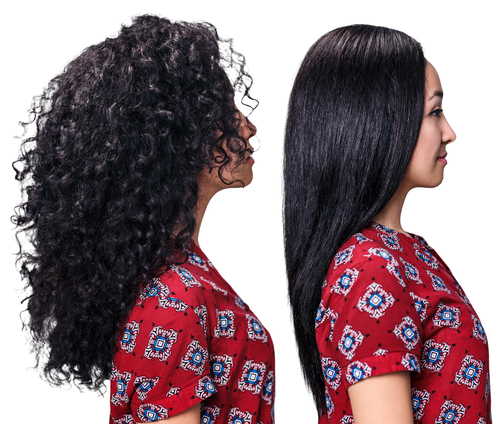 Any hair straightening procedure usually involves two steps… The first step breaks down your hair’s natural keratin formation and the second step neutralizes the keratin to shape and style your hair. How Much Does Hair Straightening Cost? The procedure costs upwards of Rs 4,000 and could vary depending on the length of your hair. What Are The Different Types Of Hair Straightening? There are multiple hair straightening procedures you can find. The results they give broadly vary upon your preference. If you want naturally straight hair, keratin and smoothening are great options. If you want poker straight hair, chemical straightening and rebonding are options you can consider. Keratin is a naturally occurring protein already present in your hair teeth and nails. It is what adds shine and lustre to your mane. External factors and age often cause keratin to reduce and therefore hair becomes rough and frizzy. The results are a reduction of frizz and curl by up to 95%. A keratin treatment for hair straightening replaces this lost keratin in your hair making it soft, shiny and manageable. It won’t give you poker straight hair, it will just look like you’ve had a blow-dry at the salon. The results often don’t last longer than 6 months. The effect tends to wear off after every wash. Although you need to use a special shampoo and conditioner, this is the safest hair straightening procedure to consider as it causes minimal hair damage. This is the procedure you need to consider if you want to have that 'I woke up like this hair'. This type of hair straightening involves the use of a chemical to smoothen out your hair. This varies from keratin which uses naturally occurring proteins. The results last longer, until your hair grows out completely, the chemically straightened hair remains straight. Be careful while opting for this procedure. Excessive chemical straightening can make your hair vulnerable to frizziness and breakage. Rebonding gives your hair extra straightness and smoothness, but it looks almost artificial and poker straight. If you’re a fan of the look, this is something you could consider. The procedure involves breaking the natural bonds in the hair. It can make the hair weak and lifeless if not done and cared for properly. As compared to smoothening and keratin, it harms the hair a lot since there are a lot of chemicals used. It harms the hair the most treatment as the chemicals used are very harsh and smells a lot. That is why post-treatment care is essential after rebonding. This sort of procedure is recommended if your hair is wavy, curly or dense. However, as soon as your hair grows, the newer hair will be as per your original hair texture. So if you have extremely curly hair, this is going to be a very high maintenance hairstyle for you. Hair smoothening leaves your hair smoother and silkier without changing your natural hair type. It just makes your hair more manageable. It helps dull, frizzy hair with split ends and makes your mane more manageable. There are chemicals used, however, this process is less harsh as compared to rebonding. The smoothening treatment lasts longer than keratin, about 6-8 months depending on how frequently you wash your hair and how well you care for it. 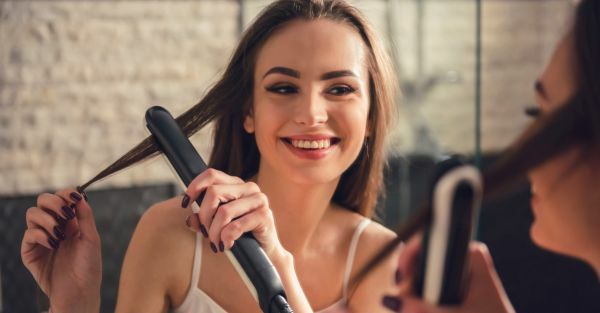 If you can't commit to any permanent procedures, it would be wise to pick up a high-quality hair iron and invest in a good heat spray before you straighten your hair with any kind of heat.